President Maithripala Sirisena handing over a request to UN Resident Coordinator Hanaa Singer seeking World Heritage recognition to the ‘Tripitaka’ - the sacred canon of Theravada Buddhism, written in Pali, at the Dalada Maligawa premises in the presence of Minister Sajith Premadasa. Housing Construction and Cultural Affairs Minister Sajith Premadasa was bestowed with the honorary title “Sasana Deepana Abhimani Sri Lanka Janaranjana” by the Malwatte Chapter for his invaluable service to the Buddha Sasana, public uplift and national development at a ceremony held in Kandy yesterday. The tragic events of May 1, 1993 in Colombo not only changed the course of Sri Lanka’s history, it also changed the life trajectory of one young man. His father, the President of the Republic, lay dead in the carnage unleashed by a suicide bomber at Armour Street, while on his way to the May Day rally. Ranasinghe Premadasa, who rose to the highest office of the land from rather humble beginnings, personified the very essence of the common man. He loved to mingle among the people against the advice of his security detail, which unfortunately led to his untimely death that day in 1993. A day of celebration of the common man ended in a tragedy with devastating consequences. For young Sajith Premadasa, then only 26, and his only sister Dulanjali, it was an unfathomable loss. But Sajith Premadasa had the steely resolve to turn this very act of adversity into a turning point in his life as well as in the country’s annals. Sajith knew he only had one option, to tread in the very footsteps of his father and dedicate his life in the service of the ordinary people. He knew that any other option would have let the people down. Educated at Royal College, London School of Economics and the University of Maryland, Sajith could very well have moved abroad for a well paying job. But even before the events of 1993, Sajith had an inkling of where he wanted to be – among the people, whose heartbeat both he and his father felt. His mother, former First Lady Hema Premadasa knew that Sajith could not be convinced to settle for any other option. The other person that encouraged him to serve the people with dedication was none other than present Speaker Karu Jayasuriya. But even in politics, Sajith could have taken the easy way out. Had he continued to represent his father’s beloved Colombo Central electorate, he could have won by record margins. But a life of comfort based in Colombo was not his idea of serving the people. Instead, he opted to settle down in remote Hambantota, which is one of the poorest districts of the country. Even in 1993, some parts of the war-torn Jaffna peninsula were better off than Hambantota in an economic sense. Sajith knew this would be an unprecedented challenge. Besides, Hambantota was the home turf of several senior politicians of the SLFP including future President Mahinda Rajapaksa. Many who knew the area called Sajith’s move politically suicidal, but he was undeterred. You could not blame them – it was a huge challenge for anyone from the UNP, even for a Presidential offspring, to take on. 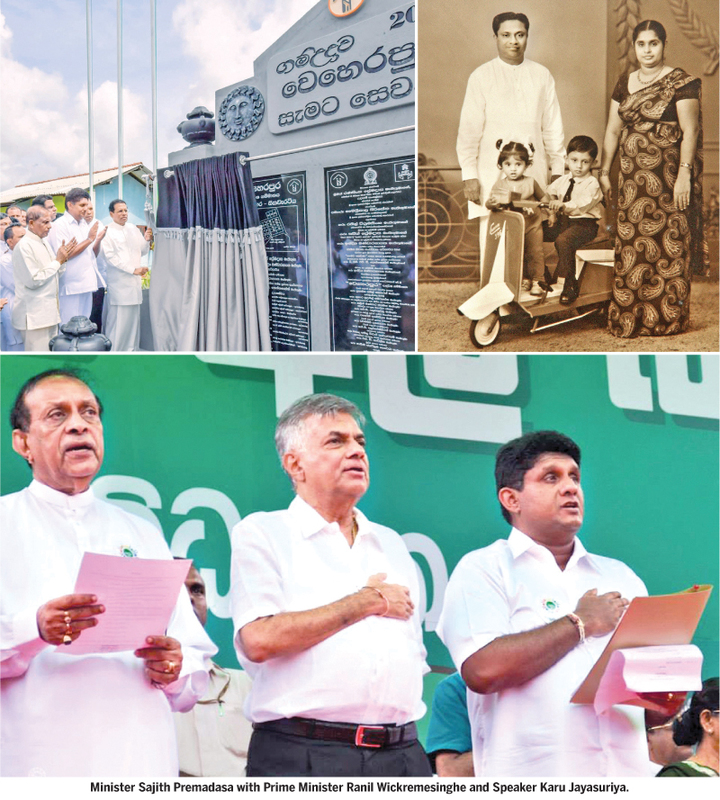 Sajith knew from the very beginning that his entire political life would be in the UNP. Leaving that and joining another party was unthinkable for him. But he also knew that hard work was the only way to climb up the party ladder- being the son of a President in itself was no qualification at the UNP to aspire to a higher position. Being dedicated to a lifetime of work was the only way to do so. Sajith was mindful of the fact that his father’s mission came to an abrupt end at the hands of an assassin. He was thus determined to see it through. Here, it is pertinent to go back four decades. Once he became Prime Minister in 1978, Ranasinghe Premadasa lost no time in seeking solutions to two of the biggest problems that existed in the country back then: abject poverty and the dearth of housing. Two of the most endearing – and enduring – programmes of the 1977 UNP Government came out as his plans for these sectors – the poverty eradication programme, later to be called Janasaviya (Strength of the Masses) and the Village Re-Awakening Programme, which later became known as Gam Udawa. The Village Reawakening Programme was launched in the 1980s with the principle that shelter is fundamental to people’s physical, psychological, social, and spiritual well-being. His aim was to build one million houses eventually. The very first “Udaa Gama” or Re-wakened Village was opened in Badalgama, which was a poor village in Yapahuwa electorate, Kurunegala district. Each village was given an appropriate name that evoked something special about the area, such as “Isuru Gama” for Village of Prosperity. He personally went to each opening ceremony, apart from the occasions when he was abroad on official business or indisposed. Sajith passionately continues this tradition. He relaunched the Gam Udawa concept with the fullest blessings of President Maithripala Sirisena and Prime Minister Ranil Wickremesinghe in 2016. Thus the first Gam Udawa village to be opened in 22 years was vested with the people in Weli Oya, a village battered by the effects of terrorism, in that year. The Gam Udawa concept is rather simple. Officials identify the poorest families in a given village who have no housing facilities. A proper land area is identified and developed. Then the Government, through the Housing Ministry, steps in to build 25-50 housing units with all facilities for these families at the given location. The construction phase itself is a collective effort of the whole village. While the Government supplies the funds and earthmoving/construction machinery, the villagers themselves have to get together to build each house using their time and labour. This brings the entire village together, enhancing their bonds of friendship. This is how the Gam Udawa concept works to this day. The Gam Udawa concept was recognized globally by the United Nations and many other international organisations for its outstanding contribution to human progress. Sajith has a vision to build thousands more Reawakened Villages throughout Sri Lanka. He travels the length and breadth of the island to open at least two Gam Uadawas almost every week. His officials have learned to fall in line with this demanding schedule, for Sajith does not tolerate slackers and shirkers on his team. Sajith is a tireless, relentless worker who does not take ‘no’ for an answer. He has paid special attention to build more Gam Udawas especially in the North and the East which were excluded during the earlier phase of the programme due to the conflict. Sajith has aligned the Gam Udawa programme with the goals of the Government’s Vision 2025 programme as well. This is a side of Sajith that is fairly well known. But those who know him intimately describe another side – Sajith is deeply religious with an intense devotion to Buddhism. He is also immensely protective of our cultural heritage, a fact that has been recognized in offering him the Cultural Ministerial portfolio in addition to Housing. He may have taken after his father in this regard, but there is no denying that Sajith has a keen and genuine concern for the welfare of Buddhism and culture in Sri Lanka. This has not been lost on the country’s Maha Sangha. Yesterday, the Maha Sangha led by Most Ven. Thibbotuwawe Sri Siddhartha Sumangala Mahanayake Thera of the Malwatte Chapter presented him with a Scroll of Honour conferring the title of “Sasana Deepana Abhimani Sri Lanka Janaranjana” for his invaluable service to the Buddha Sasana, public uplift and national development. A ceremony in this connection was held at the Malwatte Chapter headquarters in Kandy. It is no coincidence that this recognition comes soon after Speaker Karu Jayasuriya was similarly feted by the Maha Sangha with the title “Sasana Keerthi Sri Deshabhimani”. In recent times, Sajith worked closely with President Sirisena in the latter’s exemplary decision to recognize the Tripitaka, the sacred Buddhist text that contains the entire discourse of the Buddha Dhamma, as an inherent part of Sri Lanka’s culture and also launch a campaign to gain world recognition for the scriptures as part of the UNESCO Memory of the World Register. Sajith is working behind the scenes to make this a reality before long, working together with the President and Buddha Sasana Minister Gamini Jayawickrama Perera. Sajith has pointed out the need to preserve and protect Sri Lanka’s religious and cultural sites. In the true spirit of Buddhism, Sajith is an ardent advocate of recognizing the rights and needs of people belonging to all religions and communities. He is a regular visitor to places of worship where he engages in constructive conversations with the clergy on the future path of the Nation. He has taken a laudable stance on reconciliation in line with the President’s and Prime Minister’s wish for a country where everyone can live in peace and harmony. In fact, even at a purely political level, he acted as a bridge between the President and the Prime Minister during the political turbulence from October to January. Sajith’s hero will always be his father. It is no easy task to follow in the footsteps of such a gigantic figure in local politics even for a son, but so far Sajith has not put a foot wrong. Of course, there are three other people who form a tower of strength that keeps him going boldly – his mother Hema, sister Dulanjali and wife Jalani. They say that behind every successful man there is a woman, but Sajith is indeed lucky to have three. There is no doubt that with the firm backing from the Maha Sangha, other religious leaders, political leadership, family members and the public, Sajith, politically very young at 52, will surmount all obstacles and emerge triumphant in his long political journey ahead.